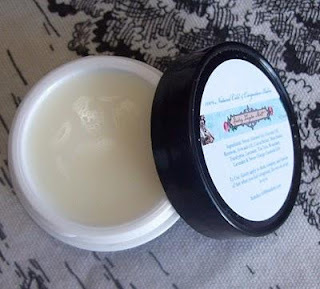 Book Review, "The Return of the Children of Light: Incan and Mayan Prophecies for a New World"
We are please to have a guest book review written by Mind Body Spirit Marketplace member Christina Dudley of Capricorn Soap Company. Thank you very much Christina! Sounds like a good read! What does our future look like? Are we progressing toward new horizons in our evolutionary process? Or are we regressing to a more base and debauched state, becoming a more primitive and darkened mankind? These are the questions we need ask ourselves, especially if we are seekers of the Mysteries of Life. 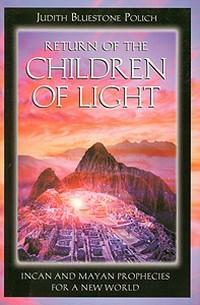 These questions are brought to light and perhaps even answered by Judith Bluestone Polich in her work "The Return of the Children of Light: Incan and Mayan Prophecies for a New World". The book begins by telling the story of an Incan priestess and her fictional journey through the levels of priesthood, mirroring the historic renderings of what modern archaeologists believe were referred to as the Virgins of the Sun. As we follow the story of the progression her enlightenment, Polich provides us with a rich array of background and historical data while at the same time entertaining and uplifting us. The reader is easily drawn into the text. By the time he or she has finished reading the brief fictional narrative, the remainder of the story beckons like a great mystery to solved. Polich’s next task is to make the reader ask the questions: What does our future look like? And, exactly where are we headed? Polich describes her own experience with the spiritual realms, taking into account a broad readership with Judeo-Christian upbringing. She describes her own epiphanies and awakenings and provides detailed references from a variety of spiritual canons to back up her claim that we are approaching a new day, a new age, and a new moment, wherein we will either claim our heritage as sons and daughters of the great light, or we will deny it - the choice is ours alone to make. This text was a delight to read and its relevancy is unquestionable for our time. Not only is it entertaining, with its brief fictional narrative and personal anecdotes from Polich herself, but it demands the reader ask herself or himself the question: what choice will I make? " We continue our series on Essential Oils. This week Karley Ziegler Mott discusses cold relief and shares some of her all natural recipes with us! We have been discussing the use of Essential Oils the past couple of weeks in Aromatherapy. Last week we discussed ways to relax and relieve stress. Today, I would like to talk about easing the symptoms of colds and congestion through Aromatherapy. I am going to share with you two great recipes to treat common symptoms such as stuffy and runny nose, congestion, cough, post nasal drip, etc. When I'm in need of some R & R, I like to enjoy a milk bath. 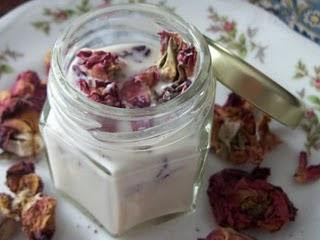 My favorite when I am feeling under the weather with a cold, congestion, or flu-like symptoms is my "decongestant" milk bath, which can be made in a large jar and refrigerated, or in small jars for one treatment. You can use mason jars, canning jars, or any clean and dry jar. Rinse out those plastics and feel free to reuse it to make this as well. a milk bath? Milk contains lactic acid, a form of alpha hydroxy acid (AHA). It helps to gently exfoliate the skin, and milk will also soften and nourish. I like to use aromatherapy as much as I can to treat symptoms of stress and illness. It is being used more and more by alternative health practitioners to treat stress when used as a complementary therapy with traditional Western medicine. Of course, I believe in going to the doctor regular and in vaccinations to prevent illness, but I take a holistic approach along with traditional medicine. Start with 1/4 cup of goat's milk (you can buy Meyenberg Goat's Milk in many grocery stores or natural food grocery stores right in the refrigerated section. I really prefer the fresh version as opposed to powder. Powdered goat's milk doesn't work as well, in my opinion, as the fresh. You can also use organic whole milk or buttermilk. I then use 1/8 cup of steeped peppermint or chamomile tea. You can skip this and just use milk if you don't have any handy. Then add in some fresh or dried peppermint. I use enough to fill a teaspoon. You can use more or less. Add in about 15 drops of peppermint essential oil, 15 drops of eucalyptus essential oil, and 10 drops of lemon essential oil. All are available at Mountain Rose Herbs or at your local natural foods store. Locally, Wegmans even has most of these in the Nature's Marketplace section. Gently mix these with a wooden spoon and pour into your jar. You will most likely have room to add more milk before you put the top on. I let this steep for a few hours. I then pour it under running hot water in the tub & light a couple of candles to soak away my cold symptoms. This blend will store in the fridge for a couple days. Apply to the chest and to the feet? The feet? Yes! Anecdotal evidence suggests that applying congestion relief products to the feet and putting cotton socks over them helps the essential oils to penetrate and do their job more effectively. I do this on my boys and on me and it really helps us! ~As always, seek a medical professional for any symptoms you may be experiencing as I am not a doctor. This is not intended to diagnose, treat, or cure any disease or ailment. Chic & Green™ is a TODAY Show (NBC) Network Blog, an MSNBC Going Green Blog, and has been named a "Best Green Blog"! Since I became involved in the Mind Body Spirit Marketplace my collection of reference material on a variety of subjects continues to grow. Today is St. Patrick's Day. I'm watching the sun coming out this morning (finally), the grass beginning to turn... and while putting on my green earrings and Celtic amulet I decided to thumb through "Saints Preserve Us" by Sean Kelly and Rosemary Rodgers to refresh my knowledge about St. Patrick. Patrick wasn't Irish; he was Welsh-Italian. His name wasn't Patrick, it was Succat. 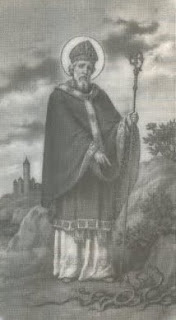 He wasn't the first Christian missionary sent to Ireland-that was Saint Palladius. And there were never any snakes in the country to begin with. But aside from that, everything you know about Patrick is true. He was declared by the Sacred Congregation of Rites to be the Patron of Nigeria in April 1961." This week, I would like to discuss the use of Essential Oils and Aromatherapy to treat stress. Everyone from time to time goes through stressful times. We have all been there. Whether it is something temporary--such as worrying about an upcoming test, or longer lasting such as an unhappy relationship, financial troubles, etc.--stress affects our bodies on so many levels. If I were to ask you what the main symptom of stress is in terms of health, you might say "a headache." Tension headaches are a very common sign. Other signs, though, is a rapid heart rate, an increase in blood sugar levels, decreased energy, skin troubles ranging from paleness to breakouts, insomnia, and depression. When I am stressed out, my skin just looks tired. My heart will race. My shoulders will tense up and have knots. I think we've all experiences these symptoms before. Then there's insomnia. If I am stressed, I go to bed and then my mind starts zooming from issue to issue and I cannot relax. Then I worry that I'll be tired the next day for not sleeping well. It's quite a cycle. It's at that time when I experience those symptoms that I realize I really need to get more in touch with my tranquil side once again. Using Essential Oils can help relieve the symptoms of stress and find our way back to that peaceful and relaxed state. Ideally, you'll also be using exercise, meditation, and healthy eating to help things along as well. The most well known oil for relaxation and stress relief is Lavender. I am beginning with this oil because it is, perhaps, the most well known of the Essential Oils. Lavender, or Lavandula Angustifolia, is commonly grown throughout Europe, particularly in Bulgaria, France, and England. It can be grown here, though. I live in New York and our climate really isn't the best for growing an abundance of beautiful lavender. That is not to say it cannot be done, though. This fragrant herb is just lovely. It works well on its own or can be used in blends to enchance its effects. Lavender, though, does much more than smell nice. A scientific research team at Texas A & M University conducted a study to measure a human's response to odor. Study participants were asleep and given EEG tests. This study was conducted in 1992 and had interesting results. It showed that Lavender Essential Oil essentially lulled the participants to sleep sooner. Lavender, though, isn't the only beneficial Essential Oil when it comes to relaxation. Chamomile is another. Chamomile, or Anthemis Nobilis, is distilled from dried flowers of the chamomile plant. Its usage dates back to ancient Egypt. Chamomile usually is found in England, North America and in most southern parts of Europe. You often hear people saying to have some chamomile tea if you need to relax a bit. Why? This Essential Oil has been shown to calm nervous personalities, anger and irritability, and anxiety. It is very soothing. I'll talk more about this another week, but just as it calms the mood, it calms even troubled skin. Lemon Essential Oil is another relaxing oil. This is surprising to many people, as Lemon (Citrus Limonum) can also be energizing. When combined with other Essential Oils, it can be wonderfully stress-relieving. It improves mental clarity and can even "lift" heavy emotions when used in conjunction with oils in a blend. Lemon calm help relieve the symptoms of tension and migraine headaches as well. Lemon Essential Oil originated in India. Ginger (Zingiber Officinale) is said to have originated in India. It also comes from the West Indies, Africa, and China. This warming oil is often used to treat muscle aches and pains and I have personally found it helpful to me when I had knots in my shoulder blades and back and need to relax and de-stress. I have found it to be particularly helpful in a recipe I am going to share with you today down below. Cedarwood is another beneficial oil, but isn't talked about as much as the others. Cedarwood, or Cedrus Atlantica, is commonly grown in Morocco, among other countries in the area. While it is woodsy and not something you'd think of as a relaxing oil, it actually is known by aromatherapists as a gentle sedative and can help to calm symptoms of anxiety. How can you reap the benefits of the Essential Oils I have mentioned? You can gently and carefully add some of them to a handkerchief and take a small sniff. You can put some in a carrier oil and apply a dab or two to the skin. Personally, I like an aromatherapy spray. Today I would like to share a recipe with you. It is for a popular product I once offered in my skin care line. Dreamland Pillow Mist combines stress-relieving essential oils into a synergistic blend and will provide the great benefits of aromatherapy. You can spray this right on your linens. I spray it on my pillowcases, sheets, and curtains. I spray it on unscented dryer sheets and even place it underneath my mattress pad. This recipe is gentle, so you can even spritz a bit on (spot test for sensitivity first, please) and enjoy its effects. One of my favorite relaxation ideas is to spray this on my towels, pop them in the dryer while I am in the tub, and then when I come out I have warm towels and aromatherapy. Combine in a bottle. This makes just over 4 ounces. You can divide it into 1 ounce or 2 ounce bottles with misting spray tops. 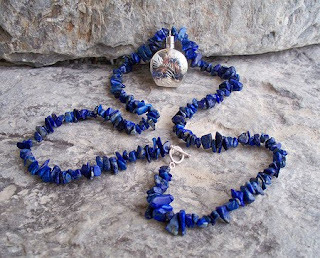 ***The beautiful Aromatherapy Necklaces pictured are by by Galleria di Giani.. Visit this great shop on Etsy for more information on these and other wonderful necklace designs. 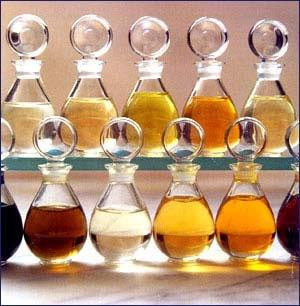 We are very pleased to begin this series of articles on Essential Oils by Karley Ziegler Mott. Karley is the author of the award winning blog "Chic and Green". She is also a long time advocate for natural health and beauty care. 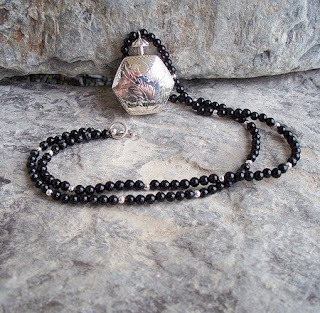 Although Karley recently retired her own skin care line, KZM Facial Care, to begin creating a line of handmade jewelry... she has continued on her quest educating the public on the ingredients found in commercially made skin care products. I can't think of a more knowledgeable person to have writing these articles for us. If any readers have questions for Karley...please feel free to post them in the "comments" section under the blog posts. She's be happy to answer them.! enjoy! Today begins our journey in a series about essential oils and aromatherapy. There are so many wonderful essential oils available today, and many have multiple benefits. We'll learn a brief history of aromatherapy, discuss the difference between essential oils and fragrance oils, and also share some wonderful recipes using essential oils. What are Essential Oils? The term "essential oil" is a bit misleading, truth be told. An essential oil is actually a concentrated compound and not an oil at all. These compounds come from various parts of plants. They can be extracted from flowers, bark, resin, leaves, roots, and peels. They are typically extracted through a method called distillation. Distillation can occur chemically or through steam and you really want them to be steam distilled. It is not always an easy process, as it is sometimes much more difficult to extract these natural compounds. You can tell how easily an essential oil is distilled by the cost. The more expensive the essential oil, the more difficult it was to extract the natural compounds from the plant. Essential Oils are very concentrated and need to be diluted prior to usage in almost every instance. The most common method is by adding Essential Oils to what is known as a Carrier Oil. Adding the concentrated Essential Oils to Grapeseed Oil, Olive Oil, Sweet Almond Oil, Safflower Oil, Avocado Oil, etc. makes it easy to reap the benefits of Aromatherapy because you can apply the oil right to your body. Essential Oils are the backbone of a practice known as Aromatherapy. Quite simply, Aromatherapy is the practice of using Essential Oils in order to promote wellness and good health. Aromatherapy used one of our key senses, that of smell. Your nerve receptors, once hit with a fragrance, send a message right up to something called the Limbic System. This is within the brain and it essentially processes a scent and gives you a certain reaction. This is the system that triggers emotional responses to fragrance. Many people associate a certain scent with a person or memory. Whenever I smell a certain department store perfume, I am reminded of my late grandmother. She always wore it when I was a child and even though she is gone, I instantly think of her when I smell it. When I smell tulips, I am always reminded of the garden I played in at my childhood home. The salty scent of ocean air reminds me of the summer we lived in Coastal Gerogia planning our wedding. Before I further discuss Essential Oils and using them for Aromatherapy, I would like to clear up a common area of confusion. A common misconception is that popular Fragrance Oils are basically the same as Essential Oils. This could not be more false. Well over 95% of an actual finished Fragrance Oil comes from petrochemicals (crude oil) and are hazardous to your health. These oils are created in a lab and are made to mimic a particular scent. You can buy bottles of synthetic fragrance oil in every type of scent these days--from rose to chocolate chip cookies to pumpkin to the scent of pizza and popcorn. It is important to remember that these highly scented oils serve no benefit, are completely synthetic, and may be very harmful. Even though much has been done to raise awareness of certain toxins, synthetic fragrance oils often contain a deadly range of toxins known as phthalates. Beginning next week, we will look at certain Essential Oils, from the most popular to the lesser known. I will discuss them with you at length and then share a recipe using Essential Oil blends. I will devote each "chapter" to certain ways to use the Oils--ranging from cold and congestion relief to relaxation to stress relief to energy boosting and so much more. I look forward to talking with you all again next week. Our first topic will be Essential Oils and relaxation.